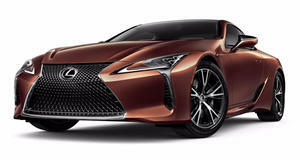 A little over two years ago we spotted a tuned Lexus LC 500 at SEMA that had us doing a double take, not only because it was the first tuned LC ever but also because the two-door sports coupe had yet to be put on sale. That custom LC kit, designed by tuners Artisan Spirit, was intended to be offered to customers once the standard cars started hitting showroom floors, but we heard nothing about it, until now. The Black Label GT LC 500 you see here was developed from that original SEMA design and was created to celebrate Artisan Spirit’s 20th anniversary. The Tokyo-based tuner has worked with a variety of high-profile manufacturers such as Porsche and Mercedes, and the subtle yet stunning styling upgrades look like they could have been an OEM option rather than some aftermarket add-ons. The carbon-reinforced plastic widebody kit is available to order either as individual components or as a complete package and there are also mechanical upgrades on offer to go with the more aggressive looks. To improve the car’s overall handling and braking capabilities, a KW suspension kit and Brembo brake upgrade can be ordered, and if you intend to track your Black Label GT LC 500, then a roll cage and Sparco race seats are a worthwhile investment as well. The upgrade we are most interested in is the engine modification pack that increases the standard 5.0-liter V8’s capacity to 5.6-liters and pushes power output from 467 horsepower up to 518 hp. Now that would give this hot LC 500 the go to match the show. Artisan Spirit has strong ties with Toyota and Lexus and future projects include modifications for the Toyota 86 as well as the newly released Supra. We can’t wait to see what they come up with.